Bernie Sanders goes on the Late Show. “My guest tonight is, as of 4:01 Eastern Time, still a Democratic candidate for president of the United States,” is how Stephen Colbert introduced Bernie Sanders before the candidate walked on to the stage of the Late Show, greeted by cheers that morphed into enthusiastic audience chants of “Bernie! Bernie!” when he sat down. “Have you gotten used to that yet?” asked Colbert. “It sounds awfully good,” responded Sanders. Sanders affirmed he was continuing with his campaign, as he did during his speech in New York Thursday night, but talk did turn to basically inevitable idea of Hillary Clinton as the Democratic nominee and the question of Trump trying to poach Sanders supporters. “Would you like to say anything to your supporters about whether they should vote for Trump?” asked Colbert. “I don’t have to say that. My supporters are smart enough to know that we do not want a bigot to become president of the United States,” Sanders responded. 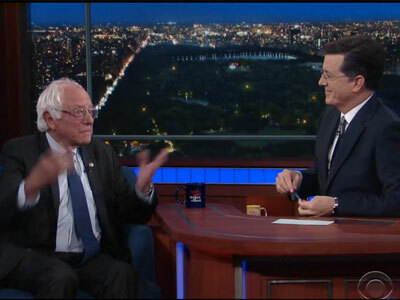 Later, Colbert asked Sanders to reflect on his campaign in the we-all-know-this-is-coming-to-an-end-even-though-there’s-been-no-official-call style of recent Sanders interviews.